It was just a company, part of a massive corporation, worth some four billion dollars. I don’t know any of the people who worked there. I wasn’t alive at the company’s inception in 1982. Hell, I didn’t even own a computer until 1992. But then why does the news that LucasArts is gone kind of bum me out? The venerable logo of a legendary company. First things first, a hat tip to George Lucas. 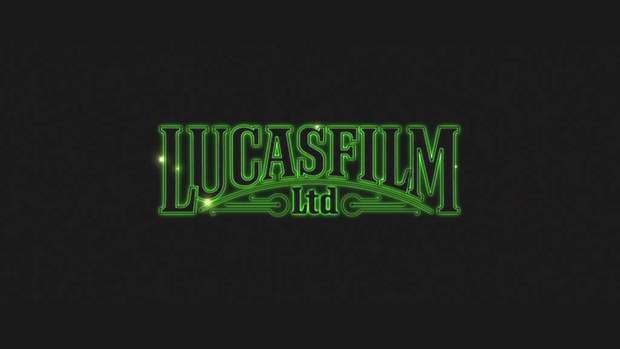 In 2013, when anyone hears or reads the word “Lucas” the mind snaps to George, the various logos, and of course, Star Wars. Back in 1982, it made sense for George to apply the Lucas name to as many things as he could. He was sitting on one of the most lucrative brands of all time, a sci-fi universe that he had dreamt up, based on his love of 1930s serials, Akira Kurosawa films and the tenets of Joseph Campbell. It made sense to start a company and get into this ‘home computer’ thing. The nuts and bolts tale of computer game history is one of both rapid change and painfully slow advancement. Unlike in other visual arts endeavours, the creative ideas developed for digital entertainment always seem to be outrunning the technology necessary to produce them. Despite this, the field of computer/video games, as an industry home to both daring invention and huge revenue, has advanced faster than any other media or artistic field. In 30 years we went from this to this. Somewhere in that heady mix (or race) of artistic expression and technical achievement, you’ll find LucasArts. My LucasArts story begins with a friend handing me, on my birthday, an unmarked clear box with five 3.5 inch disks inside. 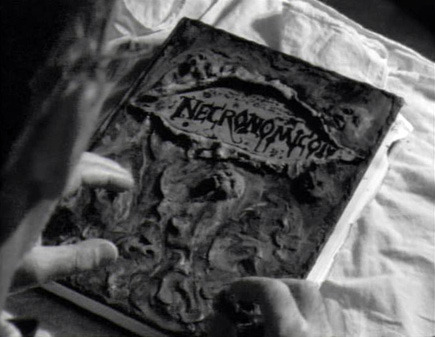 Each disk was labeled ‘The Secret of Monkey Island’, which at the time felt like stumbling onto the Necronomicon for all the meaning those words had to me (let alone the inherent power they contained). I installed the game. The wormhole opened. Life was different. As weird as it is to say my life was changed by a trip around Monkey Island, it most definitely was. Up until that point I had been merely a player of educational software, the odd low-res sports game, and maybe a shareware version of Wolfenstein. 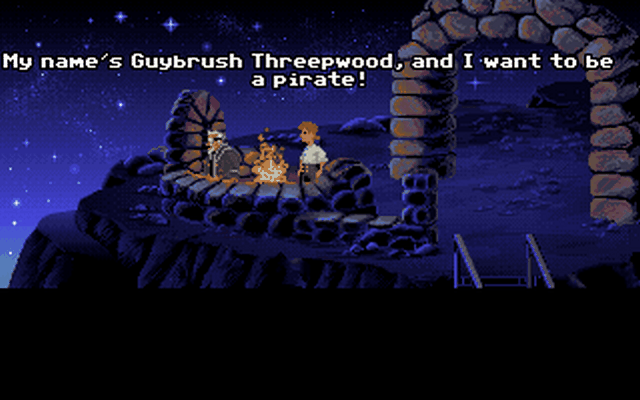 I liked the Mario Bros and F-Zero and numerous video games, but I had never seen anything that was quite so engaging, so funny, so weird, and so mysterious as the opening trials of wannabe pirate Guybrush Threepwood. My ten-year-old mind was racing; where had this game come from? Suddenly, I was a fiend for point and click adventure games and LucasArts was my saviour (or, if you ask my mom, my enabler). 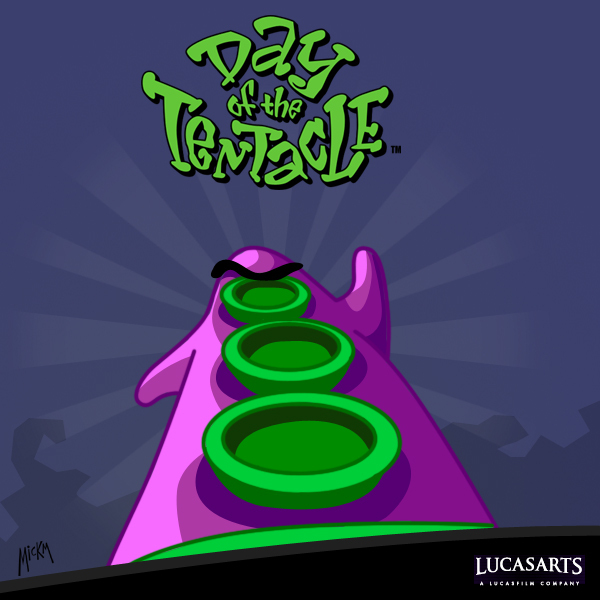 Next came a discovery of Day of the Tentacle (actual title), and the absurdity of the Sam and Max series. There were the Indiana Jones games (The Last Crusade; The Fate of Atlantis). And then, a run of real classics: the dark, Road Warrior-esque story of Full Throttle, which featured biker battles, a real rock n’ roll soundtrack and a showdown for the soul of America. Soon afterward, the return of Guybrush and that famous island in The Curse of Monkey Island, a beautifully drawn and hilariously written game that introduced us to both El Pollo Diablo and Murray the Demonic Skull. Then, in 1998, LucasArts reached its creative pinnacle with the release of Grim Fandango. Jettisoning the increasingly dated point-and-click interface (which has now ironically been replaced by the touch screen), Grim Fandango was the elegant swan song of the entire adventure game genre. I’ve written before about my love for Manny Calavera, Glottis and the gang but I’ll repeat: it is a game of touching detail and heartrending soul, it invests such charm in its characters as to make you forget you’re sitting in front of a plastic box pushing buttons on a board and when the story ends the desire is overwhelming to see more (or at least play through again). Grim Fandango did not sell well and ultimately (admittedly this is conjecture on my part) may have acted as a considerable warning against similar games in the future. 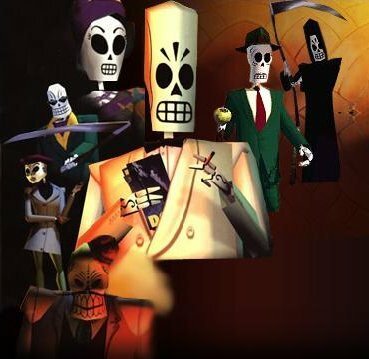 If LucasArts could sculpt something as breathtaking as Grim Fandango and lose money, then why bother? The outstanding beginning of the end. 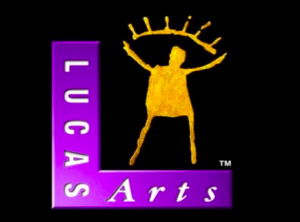 As the years passed post-Fandango, it was clear (as if it hadn’t been before) that Star Wars was the bread-and-butter of the LucasArts gaming enterprise; it was the logical conclusion of the brand. Throughout three decades, game after game based on every aspect of the Star Wars universe was produced. Some were good (the Jedi Knight series, Rogue Squadron, Knights of the Old Republic) but many were uninspired (Knights of the Old Republic II, Galaxies) or just plain bad (Rebellion, Episodes 1-3). I realize there are many games not being mentioned here, but by the end, it became a matter of quantity over quality; that special magic was gone. The last decade had seen a brief resurgence of popularity, if not outright quality, with the gleeful mixing of Lego and Star Wars (a combination that probably would have set my hair on fire had it happened in 1992) with the Lego Star Wars and Lego Indiana Jones games. Sure, it had the faint smell of corporate overload, of nostalgic fetishism, but it was still fun to blast apart storm troopers and Nazis into their component parts, to hear the theme music one more time. Once LucasArts was sold to Disney, the end, like a tank rolling headlong towards a cliff, must have been in sight. The value of the company had become securely tied purely to the franchise logos themselves. There was no longer a need to maintain a costly studio, to build new games from the ground up, to invent new worlds to explore and experiment with. The last LucasArts game I played was the forgotten adventure The Dig. It’s the one with the names of Steven Spielberg and Orson Scott Card all over it. In it, a space crew gets transported to an distant planet that appears lifeless at first, but upon which, gradually, a history and culture emerge. There is some menace in the game, some vague sense of foreboding and evil, but very little violence. The player wanders around, explores, and puzzles things out. The ending involves an alien race that sought unchanging eternity, a fate that ultimately doomed them in life but preserved a record of their existence for all time. As an epitaph, it feels appropriate; the real life space LucasArts existed in is gone, the office closed and its people moved on, but we can still always revisit those classic digital landscapes to learn and be entertained anew. If you ever had any doubt, I think you can rest assured – you are a card-carrying geek.